Been several weeks since the last post! Just crazy things going on – as with anyone. 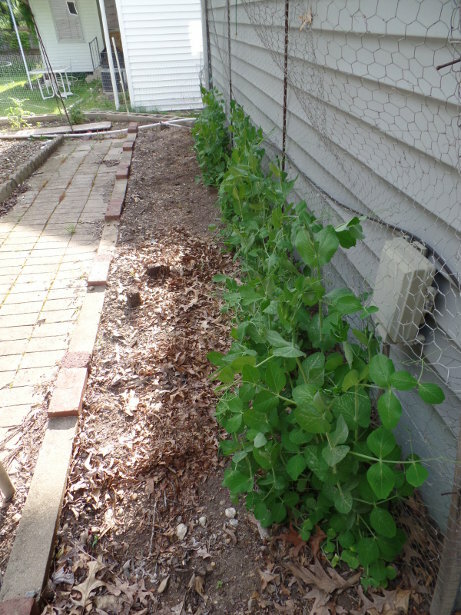 Last week, I slowly went through the garden and got the weeding done. Had to pace myself a little at a time because they were already getting overtaken by weeds. A job that no one likes to do! So these photos were all taken on the 21st of May even though it is now the 25th when I am posting. First up – the lettuce. We have a problem. Just cannot win for losing. 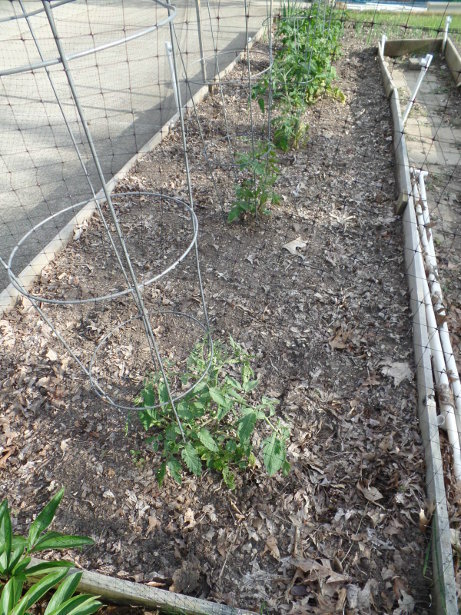 Last year, deer obliterated all of the tomatoes and green beans in the front garden. So, seven-foot deer fencing was put up around it. Now this year, we have something eating the lettuce. 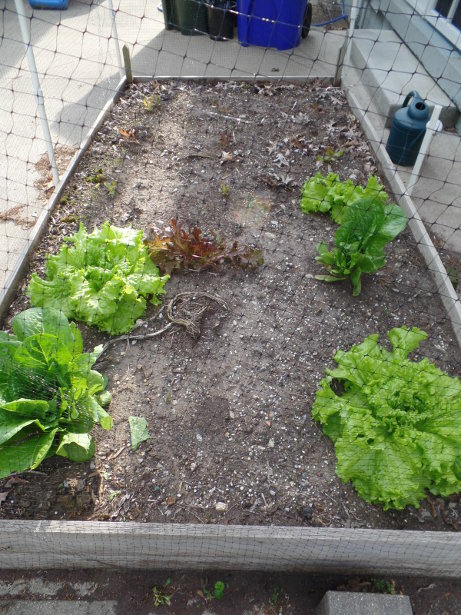 The lettuce is now worse than what this picture shows. Just yesterday, my wife said it looked like a wood chuck or a beaver was eating the lettuce. She saw it when she was leaving the house (since this bed is just by our back patio). Deer netting was already put around this bed, but it is just going right under it. And now, just this morning as I was heading out the door, I looked at the peas. The peas are pretty much a total loss. Granted, I did not put any kind of protection around them – but they are between the garage and the house. 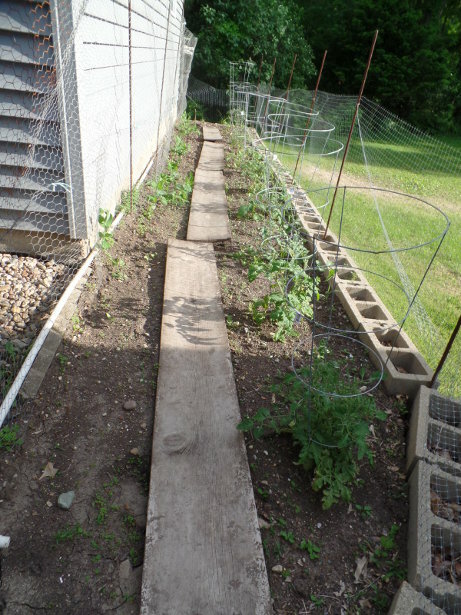 So the picture below show the peas in good shape, but they have been eaten at least half way down now. What a shame. Just every year, we have a new animal that gets into stuff it seems like! Anyways, moving to the back garden. The tomato plants don’t look great. Behind the garage, it gets sun in the afternoon – maybe after 1 or 2 pm. So, they are most likely not getting the light they need. But hey, I didn’t just want to throw the plants out since they were usable – but I had no other place to put them. 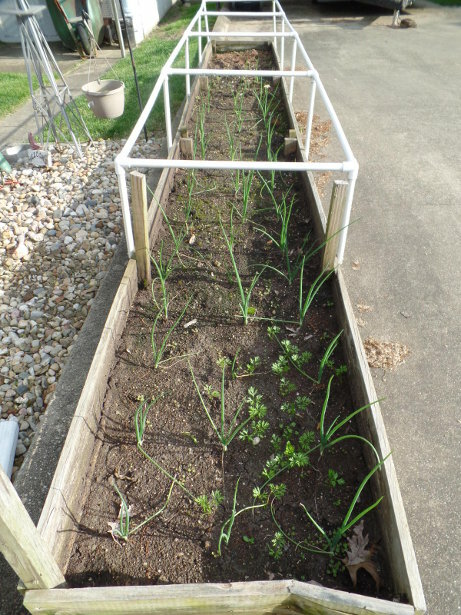 Over in the bed where the carrots typically grow, the onions are doing very well – much better than the onions planted in the front garden! Just seems like they are growing faster. 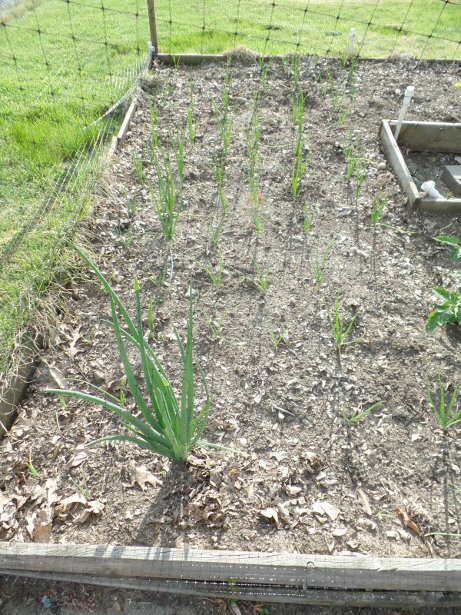 The big one right in the front was an onion that came from last year. I must have left something over and it started sprouting in the spring. Definitely a lot larger than the others that were transplanted into the garden. That makes me really wonder if I should just starting seeding the onions directly outside based on how well this one came up. 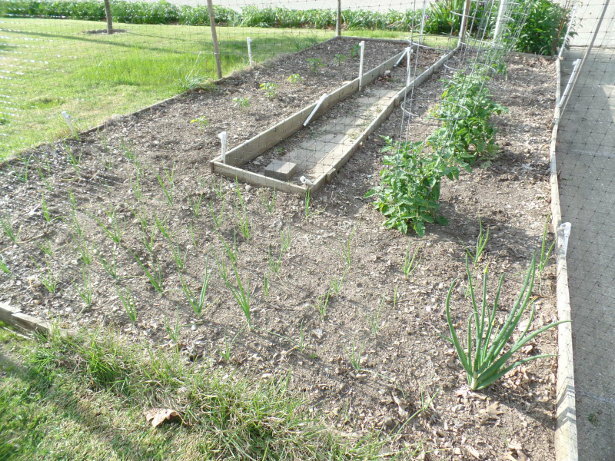 But, I’ve had such bad germination rates with onion seed that there will be lots of missed spots I fear. All nice and clean eh? Yep, a lot of weeding to get all of this cleaned up. 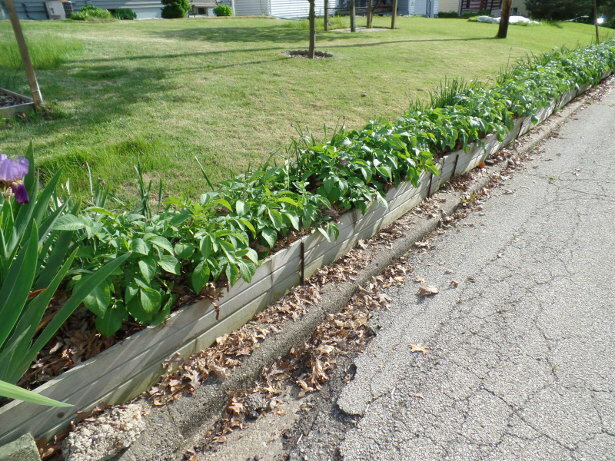 The row of peppers are not growing very well and look ill. I need to possibly get some epsom salts added around the plants since I’ve read that it does great. And the one year that I did add epsom salts around peppers, it did seem like it made a difference. 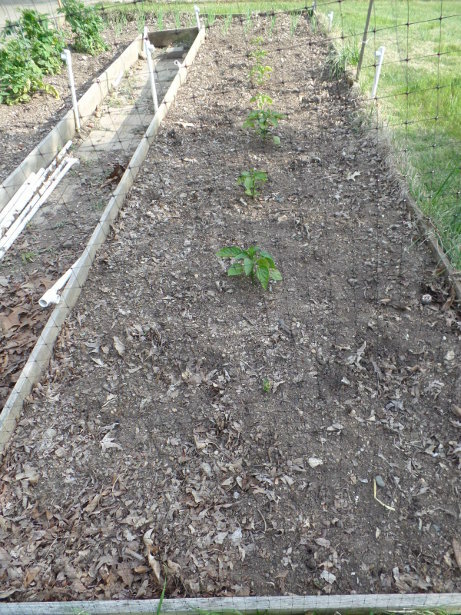 Just last night, I did get the green beans all planted. I didn’t know if I would ever get them done, but I forced myself to get out into the garden last night so they hopefully will germinate now. Next up – potatoes. This weekend, I got the potatoes all ‘mulched’. I keep a couple of large containers of mulched-up leaves and grass. So it was all spread under the potatoes to help keep moisture in and prevent green potatoes. 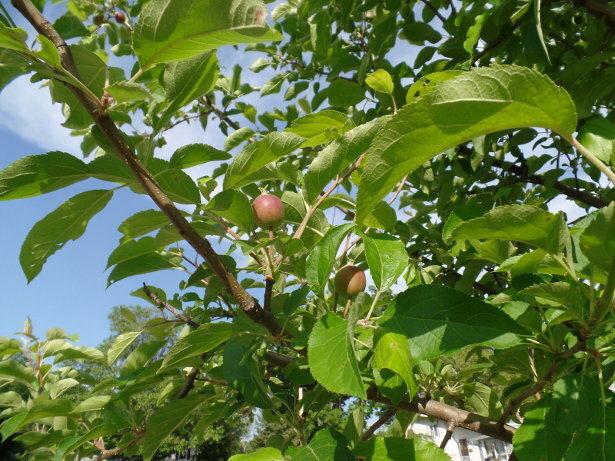 And lastly for the ‘other’ section for the garden that is out year-round – flowers and fruit! 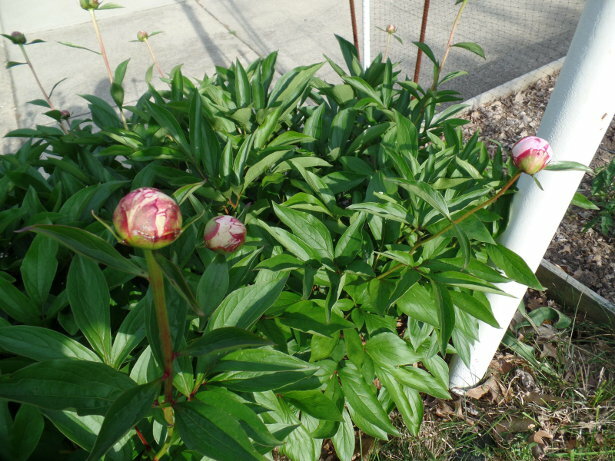 The peony in the front has finally opened up with some nice, large pink flowers. When this picture was taken, they were just ready to pop out. 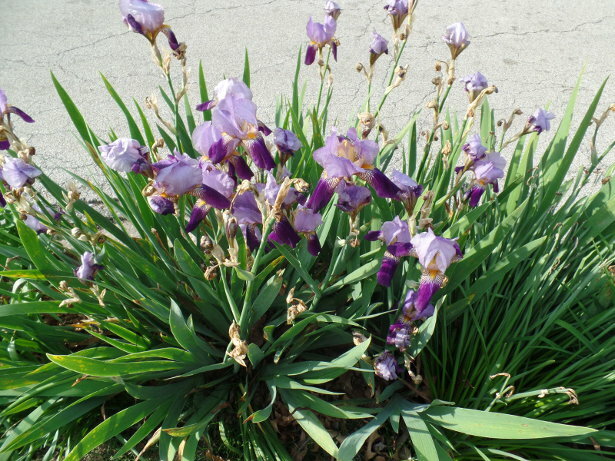 The Iris plants near the driveway and road were very pretty for about a week or so. But just in the past couple of days, they have already shed all of the flowers. Just as one flower goes, the next one comes up. And lastly, it looks like we may get a few Granny Smith apples this year. They are up high enough so the deer cannot get to them. Here are a few that are in the beginning stages. That does it for now.. until next time! Renee’ was referred to us from a marketing individual that we are helping with their website. Our marketing client said that they began doing some work for Renee’ and her virtual assistant business, and they recommended that she get a website. So, we reached out to Renee’ to see how we could help. After getting the list of items that she wanted on the website, we got started right away. Over the course of about a week, we made the requested changes to her site and today it was just published and is open for business! We appreciate the business from Renee’ and we are glad that BsnTech Networks could provide low cost website design services to her. 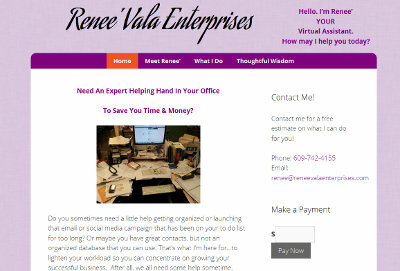 Renee’ Vala Enterprises website is at reneevalaenterprises.com. 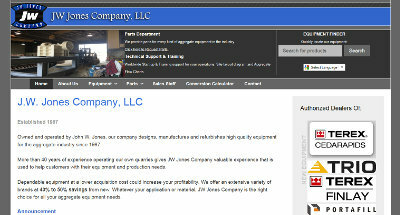 Trent, a representative of JW Jones Company, contacted us to have a new website created for the company. He said that the current website was outdated and extremely difficult to update. When they needed to add equipment to their website, it required a lot of work to manually update links and several pages to include the new equipment (or to remove equipment). Trent noted that he got a couple of other quotes were extremely high. He was referred to us by one of our partners, Midwest First Wireless Internet. We provided Trent a quote for the website and he immediately wanted to get started. Upon further communications with him, our quote was 90% less than others that he received. The main factor of the website was to create an equipment inventory on the site which was easier to manage and update. With the systems we use to create websites, the inventory is ‘dynamic’, you simply create a new piece of inventory, add a description, title, upload some pictures, and add it to one or more categories. Upon saving, it is automatically added to the pages for those inventory pages. Trent also noted that they had two separate websites – one for English and one for Spanish. With the new site, they decided to use the Google Translation bar in order to have only one website – instead of having two duplicate sites in a different language. Today, the website was just transferred to their hosting provider and it is now live! We appreciate the opportunity to create this website for Trent and JW Jones Company. He has already expressed that he will be using us for future requests as well. The website for JW Jones Company is jwjonescompany.com. Brandon, the owner of Roanoke Exterior Wash, contacted us in the middle of last week. 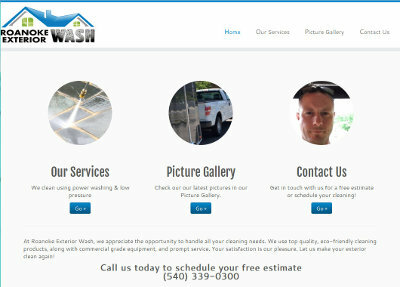 He needed to have a simple site, but professional site, created for his exterior washing business. He said that he had started by getting a domain name and getting a website builder account setup, but wasn’t sure if he started right. Initially, he had some hesitation about working with BsnTech since we were not local to Roanoke. He did get an estimate from a local web designer, although we are not sure what kind of cost they quoted him. BsnTech sent Brandon a fully detailed, itemized estimate for his website needs along with some links to our portfolio and customer reviews. A couple days later, Brandon called and said that he was ready to get started on his website after seeing our price, explaining our turn-around time, and seeing the customer reviews. Brandon sent us the information for his website over the weekend. Monday morning, we completed the majority of the website. Brandon provided us some updates and some new pictures on Tuesday – and the website was fully done and approved by Wednesday afternoon. We appreciate the business that Brandon gave us and are glad that he chose our affordable website design services. The website for Roanoke Exterior Wash is at roanokeexteriorwash.com. 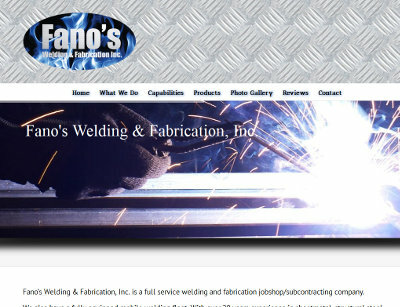 Website Design for Fano’s Welding & Fabrication, Inc.
Chris, the President of Fano’s Welding & Fabrication, Inc contacted us last week about website design services. He requested to have a site that was professional with a few different features – ranging from a picture gallery, a contact form, mobile friendly, a homepage slideshow, and social networking integration. We got started on the website pretty quickly for Chris once we began obtaining some of the requirements he had for the site. We put together an initial design and Chris was impressed with the turn-around time with getting the materials done. He then sent us photos to put in his picture gallery and followed up with the text information for each page. Less than a week later, Chris has approved of the website and it is up and running! We appreciate the business from Chris and hope that we can help in the future with any other website or graphic design needs. The website for Fano’s Welding & Fabrication, Inc is fanoswelding.com. Logo Design For Fanos Welding & Fabrication, Inc.
Chris, the President of Fanos Welding & Fabrication, Inc. had contacted us last week to have a website created. He noted that he had worked with someone else prior but the work they did looked very ‘cartoonish’. In addition, he opted to have us also create a professional logo design for his company as well. We sent over the order for the logo design to our new logo designer. Within two days, Chris was presented with three mock-up designs to choose from. After some slight modifications, he was happy with the result. This video tutorial provides our customers with information on how to manage and update their real estate listings. Dave and Anna, the owners of Christian Witness Network, contacted BsnTech over a year ago asking about our website design service offerings. They were looking to potentially start a new business that sells Christian T-Shirts – on a basis where there would be one shirt provided and then a new shirt would be updated on the website after a specified time period. About a month ago, Dave and Anna decided to move forward with the website since they got the business started. They emphasized having a very simple and easy to navigate website to make it easy for their customers to get to the shirts, order them, and checkout quickly. They provided the graphics for the site and we implemented it right away. After a few modifications, the website is now up and running and open for business! We appreciate the trust that Dave and Anna put in us and are glad to help out in this endeavour. The Christian Witness Network website is at christianwitnessnetwork.com. Kevin, the owner of Coastal Autoworks, contacted us about two weeks ago asking about our website design services. Initially, he preferred someone local to his area near Castle Hayne, NC but in the end, decided on BsnTech because of the turn-around time we were able to provide. Kevin provided us the material for the website very quickly along with the layout/design that he wanted. We got the initial draft completed the same day that he completed the order. Over about a week’s period of time after that, we worked to modify the slideshow pictures along with the header of the site. Late last week, he approved of the website and was very impressed with the work and the turn-around time that we provided as promised. We appreciate the business from Kevin! The Coastal Autoworks website is at coastalautoworks.com. Steve, the owner of ES Contracting Services, contacted us several weeks back to create a very simple website for his general contracting service business out of Philadelphia. He already had an exact design that he wanted us to create for him. He provided the text material and we had the website up within a few days. Steve then registered a secondary domain name and had some changes that he needed to be made on the site. While all of the changes were done several weeks back, we had difficulty getting the two domain names transferred from the other company he registered them through. We have finally been successful in getting the domain names – and have now considered his project completed. 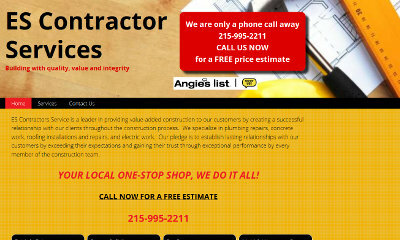 The website for ES Contracting Services is at mrjbcontractor.com.